Designer Nishka Lulla is all set to tie the knot with businessman Dhruv Mehra in Bangkok, Thailand. Before jetting off to the destination wedding, the duo hosted a brunch in Mumbai for family and friends. Not only is Nishka herself a well-known name within the fraternity, she also has a long-lasting relationship with the fraternity, given that mum Neeta Lulla is also a designer, and a National Award winning one at that! The event had attendees in a mix of Western and Indian attires. Given that it was a pre-wedding brunch, it was also hard to judge what should have been the dress code. The bride-to-be sported a design by her mother. If you know Nishka’s style, you know she’s an ultra girly-girl, so the fact that she went all out in this light pink princess-gown came as no surprise. Seems like the event actually had a Disney/Fairytale theme, even though not many guests seemed to abide by it. I do think Nishka’s outfit was more appropriate for an evening event, but she’s the bride, she can get away with anything! Esha has some solid ties with the Lulla family, so no surprise that she was in attendance with hubby. Sadly it wasn’t an outing fashion enthusiasts can be celebrating. The floral crop top and skirt was not working. And let’s not even get started on the hair and makeup or rather the lack of. Esha clearly was not in the mood for dressing up for this brunch. Alka went with a floor length anarkali, which featured a floral shrug. One to usual let us down this look was a very pleasant surprise! The singer looked fabulous! I’m not always a fan of net-esque sarees, so I am surprised that I’m loving Bhagyashree’s brunch look so much! I think it’s the fact that it’s lace and not net that works for me. To add to that the beautiful hair and striking lips, and it just seals the deal. Don’t think the red nails were needed and the clutch should have definitely been swapped in for something more appropriate. Despite these two small glitches, this look works! Juhi gave us a few stylised looks recently, but sadly with this brunch look we took a minor step back, not a complete step back but a minor one. Loving the tunic & pants combination but the shoes and clutch added unneeded bling. Though I am willing to look past all that if I can just convince Juhi to put in a wee bit more effort in hair and make up! Eros’s head honcho Krishika Lulla suffered from a serious case of “overgrown-teen” with her attire of choice. Nothing works with this look and frankly Ms Lulla looks quite uncomfortable. 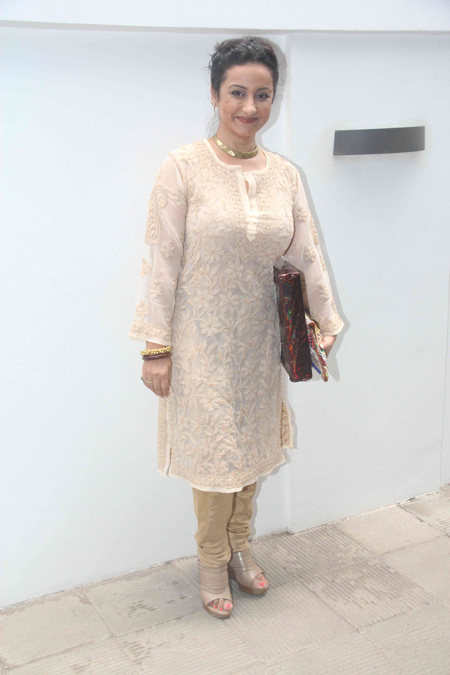 It was a simple chikankari kurta set for Divya. Loving that this was an obvious casual brunch look but with a desi vibe. Though I can’t help but wish that she’d given the clogs a miss and opted for a nice pair of kolhapuris and also let that beautiful hair lose. It would have made a world of a difference to this look. Tanisha put in an appearance in a…no prizes for guessing, Payal Singhal outfit. She worked the all white embellished look quite well. Whether it was intentional or not but somehow I see this look blending with the fairy-tale theme as it does have Jasmine vibe to it. If you turn a blind eye to the horrendous shoe choice, this one is a winner. With celeb weddings there is always one fashionista/actress who overdoes it. At this event it was Neha. Usually I would love this outfit but here it felt a bit too much for a brunch. Also not loving the way the dupatta is draped. So all in all, loving the Rohit Bal, the headpiece and the shades but wished she’d kept this look for a more appropriate event. 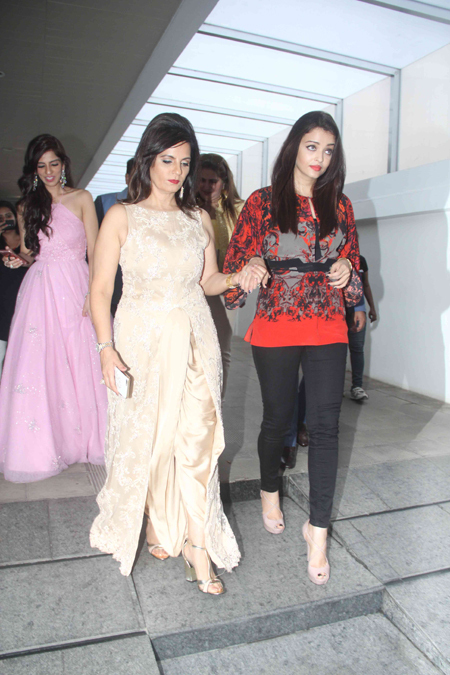 Aishwarya made a stop at the brunch in a very ultra casual look which featured a printed kimono top. Wouldn’t mind this outfit had the hair and shoes been changed. Tamanna was in attendance in a Sabyasachi jumpsuit. I really want to like this look but the hair color is really making it hard. It doesn’t help that Anushka rocked a variation of the same jumpsuit at another event which just makes you realise how amazing Tamanna’s look could have been. It was a pastel maxi with pink lips for Neetu for the brunch. This was a great look in concept but given the obvious fitting issues it just did not pan out well. But the lady that did pastel maxi right was Nimrat Kaur! She looked ravishing in her brunch attire! Especially loved the soft curls that she opted for to compliment the breezy look. Doing all pink was Shamita at the event in a skater dress and printed heals. You’d think this one wouldn’t work out given that it could be an overkill of pink but somehow it works! I think it’s the beautiful tresses that break up all that pink which worked in Shamita’s favour. Especially love that belt! Designer, stylist, entrepreneur and soon-to-be actress Pernia Qureshi attended the event sporting one of her own designs. Not a fan of the outfit so no matter how well this would be put together don’t think this could have been a winning look for me. It all seems too forced! Swara kept it ultra casual in a mini printed dress. Don’t think she was hoping to woo the fashion critics with this look and well…she didn’t. It was a SS Suryah dress for Sonal Chauhan. The dress in concept did not work and the execution did not help.